IRAQ is ablaze as resistance forces and the Shia Mahdi Army militia take on the American war-machine on the streets in Baghdad and throughout the country. The Mahdi Army has driven Ukrainian lackey troops out of Kut and taken control of the Shia holy city of Najaf and the town of Kufah. Shia militiamen, alongside Sunni mujahadeen fighters are beating off American attacks in the working class areas of Baghdad and defiant Fallujah continues to beat back besieging US Marines. And former leader Saddam Hussein, captured last December, has been flown out of Iraq to an American air-base in the Gulf state of Qatar to foil any attempt by the Baathist resistance to rescue him. Over 40 American soldiers have been killed and many more wounded in a week of resistance charged by the Americans’ attempt to arrest a popular Shia cleric. Muqtada Sadr is the 30-year-old son of Ayatollah Muhammad Sadiq al Sadr, a Shia cleric and opponent of the Baath who was killed in 1999. The poor quarter of Baghdad once known as “Saddam City” is now called “Sadr City” by its largely Shia population. Though a junior cleric, Muqtada Sadr, is immensely respected in the Shia community because of his father – and because he has consistently opposed the occupation from day one. Last week the US governor, Paul Bremer, decided to move against him. Muqtada Sadr’s newspaper was banned for 60 days for publishing an editorial supporting the resistance. Sadr’s deputy was arrested and a warrant was issued for Sadr’s arrest on trumped-up charges of being behind the assassination of a pro-American Shia cleric last year. Sadr went into hiding while his supporters, backed by the Mahdi Army militia, took control of government offices in all the Shia areas including Sadr City and Basra, the hub of British occupied southern Iraq. In Baghdad Shia militiamen are fighting side by side with Sunni Muslim partisans for the first time. American troops backed up by helicopter gunships have been pouring fire on residential areas killing and wounding hundreds of civilians in the struggle for control of this part of the capital. The Shia religious elders who sit warily on the puppet “interim council” have avoided directly calling on their community to rise up against the occupiers confining their demands to free elections this June. Now they are under increasing pressure to publicly call for the defence of Muqtada Sadr, who is now in Najaf. 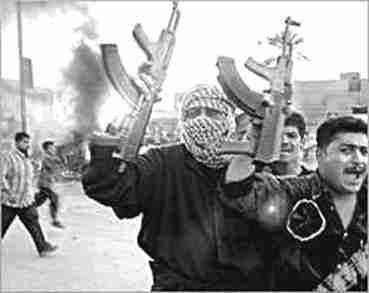 Meanwhile crack American units have launched raids into Fallujah, the centre of nationalist resistance where four American “contractors” were lynched by an angry mob last week when they drove through the centre of the city. Over 40 civilians were killed when a mosque compound in Fallujah was rocketed by American aviation on Wednesday. The town remains under partisan control. The United National Council of the Iraqi Resistance (UNCIR) has called on all Iraqis who are serving the occupation to now join the resistance. In a communique issued last week the UNCIR called for the continuation of the resistance in all its forms – armed struggle, demonstrations and boycotts. It called for the withdrawal of all occupation forces followed by the establishment of a provisional government that would hold free elections, under the supervision of the Arab League and international observers, for a new national assembly. UNCIR stressed the necessity of developing the existing autonomy of Iraqi Kurdistan, granted in the 1970s by the old Baath government, to guarantee the national and cultural rights of the region within the framework of Iraqi national unity and sovereignty. UNCIR was formed ten months ago from members of the Iraqi armed forces and security services, political, tribal and religious leaders and patriots prepared to fight to drive the imperialists out of their country. US General Mark Kemmitt vowed to destroy the Mahdi Army at a press conference in Baghdad this week boasting that his attacks would be “deliberate, precise and they will be successful”. But with Shia and Sunni Muslims closing ranks to fight the common enemy this week the imperialists worst nightmares are now coming true. Victory to the freedom fighters! FIERCE FIGHTING is raging throughout Iraq as patriotic militias battle to drive the American-led occupation army out of their towns and villages. The forces of imperialism have their backs against the wall. Anglo-American imperialism hoped to establish a prolonged protectorate over Iraq to plunder the country’s immense oil reserves. They hoped to set up a puppet regime comprised of spivs and agents of imperialism to legitimise their neo-colonialist ambitions. They believed they could crush all resistance with the might of their armies. Now these dreams are vanishing in the streets of Baghdad and fighting Fallujah. No one can believe a word Tony Blair says these days, least of all about Iraq. Britain’s shameful role in Bush’s war was based on a monstrous lie. The British people and the Labour Party Blair claims to lead were tricked and deceived. No weapons of mass destruction have been found. No one in Iraq wants Anglo-American rule apart from a tiny band of collaborators and traitors. British troops have been doing America’s dirty work in southern Iraq for over a year. Now they are facing the wrath of the Iraqi masses who want them out, along with all the other occupation forces. The Iraqi people are fighting for freedom. They’ve taken up the gun to restore their independence and the right to control their own resources. They’re struggling to rid their country from imperialist occupation. Sooner or later they will win. In Britain the anti-war movement must redouble its efforts for the biggest possible mobilisation against the war and for the immediate and unconditional withdrawal of all British troops from Iraq. For months the Government has pandered to Tory press hysteria over asylum-seekers. Using the lexicon of the racists and fascists, the reactionary press have spread the myth that the country is being swamped by “bogus” asylum seekers and that working people from ethnic minorities benefit from better funding and resources. The ruling class seek to keep black and white workers divided, each thinking the other is more privileged when in reality both are cheated, deprived and oppressed, though on average black and ethnic minority workers are more oppressed and deprived. Now under Tory attack over alleged bending of the rules to favour imperialism’s client states in eastern Europe Blair has belatedly come to the defence of the ethnic minorities. All asylum-seekers should be entitled to basic social security benefits so that the cost of their maintenance does not fall on a handful of local communities while their claims are being processed. Britain is a fabulously rich country and if the costs are shared fairly and funded through centralised, progressive taxation this should cause the working class no hardship at all. The racist Asylum and Immigration Acts passed by both Labour and the Tories during the 1990s must be repealed.